Driving southeast on SR-99 through the town of Ripon I came upon the Fulton Avenue Overcrossing (29 0185). Although the bridge isn't that interesting (a 5 span continuous concrete box girder bridge) I was impressed by its ability to accommodate a variety of lifeline/transportation modes in a very efficient manner. Starting at the left side of the bridge, the first span goes over the frontage road, the next two spans cross over the six lane expressway, the forth span crosses over a wide shoulder, and the fifth span crosses over railroad tracks. Roads that cross over expressways require steep embankments to attain the proper vertical clearance. The embankment on the right side includes a tunnel for the southbound frontage road. This is a clever solution that minimizes the amount of right-of-way required for the bridge. Without the tunnel, the embankment would have to be placed further to the west taking up valuable real estate. I'm surprised that we don't see more bridge embankments with tunnels going through them. However, the transportation engineer still has some more tools to make this interchange more efficient. 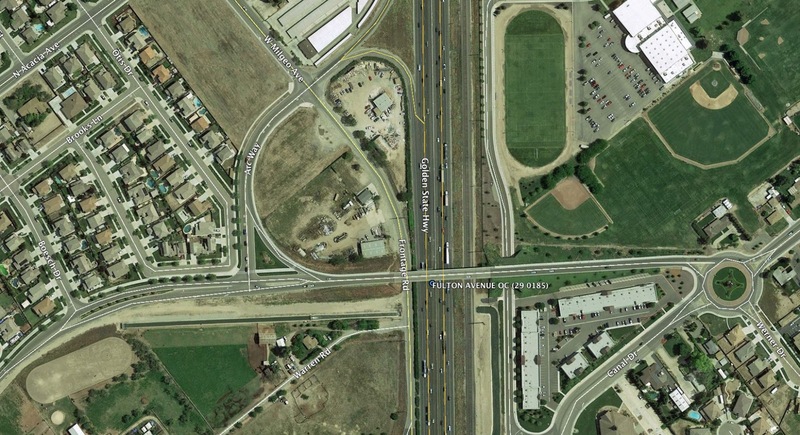 The right embankment ends in a traffic circle while the left embankment carries on and off ramps between Fulton Road and SR-99. Bridge engineers too often think of roads as a way to connect our bridges, but (of course) bridges are just a small part of the transportation system. San Joaquin County, California Bridges: Fulton Avenue Overcrossing across State Route 99 by Mark Yashinsky is licensed under a Creative Commons Attribution-NonCommercial-NoDerivatives 4.0 International License.